This week has been more interesting than usual. I've been suffering from Pandora withdrawals, because it's not available here. But I just discovered iHeartRadio DOES work and so I've been getting my dose of Christmas music. It's helping it feel more like Christmas since it's 35 and muggy here (That's 35 Centigrade, folks). Because of a wedding that many hospital staff attended, I filled in on Sunday and then took Monday and Tuesday off. On Saturday I went to a cultural festival in Kumba, 80 minutes travel by bus. I went with three Germans and an Irish guy, all either volunteering or studying in Buea. I know one of the Germans from the gym I've been frequenting. We left Buea at 9:45 and rolled into Kumba at 11:15ish. I felt a little out of place with my companions since they are all pretty much athiests, and drink alcohol, smoke (grass all of them, tobacco a couple), etc. Meanwhile, little Seventh-day Adventist, vegetarian Corbin packed his own lunch and just watched them drink beers and smoke for like three hours after the festival. But we got along fine. Kumba is way hotter than Buea! It was probably 40+ there. I've never been so glad to shell out 350 francs for a cold bottle of pineapple juice. My camera was working thanks to the electronics guy (even though he gouged me). Took plenty of pictures of all the colorful costumes and videos of a few dances. They also had booths displaying artwork, and one guy taught me how to weave a bracelet out of banana leaf fibers, and I not only got to keep my finished product but received an extra. All for the low, low price of free! At one point I was asking for a group photo with an all-girls dance team, and two guys came up and got very angry with me, saying "This isn't Europe, it's Africa, you're disrespecting our culture, blah, blah, blah." (Nevermind the fact that I've never set foot in Europe, but it was an honest mistake, I'm white after all). An older gentleman dressed in nice, traditional Cameroonian clothes came up and basically told them to get lost, and that spreading their culture to other places is exactly why they were having the festival in the first place. Turns out this guy was a chief, so he didn't  have to argue for very long to convince them. One of the mad guys even took the photo. After the festival ended at 4:00, we somehow landed an invite to what we think was a beauty pageant. I guess they're always eager to have a little diversity to spice up events. We got there two hours after it was supposed to have started. It hadn't. One of the guys made a mistake of sitting in a place where chiefs were supposed to sit. After being discreetly censured, they decided it was time to leave. During this entire ordeal and subsequent group decision to bail, I was stuck in formalities with a talkative chief, so I didn't get a vote. He was wearing a hat that had a wire nest on top, and the wires kept poking me in the face. The main reason cited for our departure was that the chiefs section was empty, so it was still going to be a long time until it began. This reasoning was good enough for me, but I also suspect a little bit of injured pride on the part of the straying Irishman. The bus ride back left me very saddle sore. Changing positions was impossible as packed in there as we were, and to put it nicely, my knickers were in a knot. I just wanted a cold shower after sweating it out all day (Luck for me, cold showers are the only thing on the menu here!) We got back around 10:30, so not as late as I had expected. The Bellosillos finally came back to the hospital on Monday. They were gone for just over 2 weeks. One of the nurses here has been on leave and had her baby just last Thursday via c-section. I went with a few of the other nurses to visit on Sunday and got to hold him. He was a big boy, 4.5 kilos at birth! Tuesday after making myself pancakes, I went to Limbe. First I visited the botanical gardens and spent about an hour wandering around. It's an expansive plot of land, and from what I could tell they're very understaffed. Parts were really overgrown but it was still very peaceful and a beautiful spot to relax. Honestly, the overgrown parts gave a cool abandoned feel to the place, enhancing the peaceful ambiance. After that I wandered over to a souvenir shop that I found during my first "real" visit (in the daytime, not stuck at the fish huts). It was closed when I discovered it, but this time it was open so I went in and perused the goods. After that I walked to a restaurant I'd seen advertising a buffet earlier that morning. It wasn't a true buffet, since they only let you fill your plate once, but for 3500 francs it was a good deal. For dessert I threw restraint to the wind and got ice cream for another 1000 francs. Next, I caught a taxi to a beach I haven't been to before. This one had more of an actual "beach" and not just a stony slope and then the ocean like the last beach I was at. It was a black sand beach, which was neat, but black sand gets HOT and I forgot to bring my chunklas so my feet got fried! Still, I had the entire beach to myself, so it was a pretty awesome time body surfing and rolling around in the sand. It was sunny too, a nice change from my first visit when it rained three times and was cloudy the whole time I spent at the beach. Unfortunately my camera quite working again while I was there, so yesterday I took it back into the shop and let them know what I thought of the price and quality of their work. Guess he's gonna look at it again, and said I won't pay any more. Of course I won't pay any more! Last thing that happened this week was that I attempted to cut my hair by myself with my cordless beard trimmer. MISTAKE. I started off at a reasonable length and was struggling with the teeth getting clogged by my hair. I was kind of acting on an impulse to begin with, so I just took the guide off, bit the bullet, and started cuttin. I made it most of the way problem free, but then my battery ran out. I ended up having to use a razor to shave off chunks of 2 inch long hair that I missed. I got razor burn really bad (like bleeding out on the bathroom floor status). Took me like 2 hours to go  from Let's make a bad decision tonight to having a haircut that didn't look like I lost a fight with Edward Scissorhands (looks more like I lost a bet). After that I still had to shower and put some salve on my stinging scalp. It was midnight by the time I crawled into bed, my head spinning from what I'd just done (or the loss of blood...?). I haven't been this bald since I was 6 and my mom decided to try it on me and my brother. Wasn't a good look then, and here's a surprise: It still isn't! The good part about hairstyles is that they always seem to grow on you! Anyways, until next time, Feliz Navidad, vaya con dios, yo querisimo Taco Bell...   And in French I believe that'd be au revoir, Joyeaux Noel, adieu, je veux beaucoup Taco Bell. 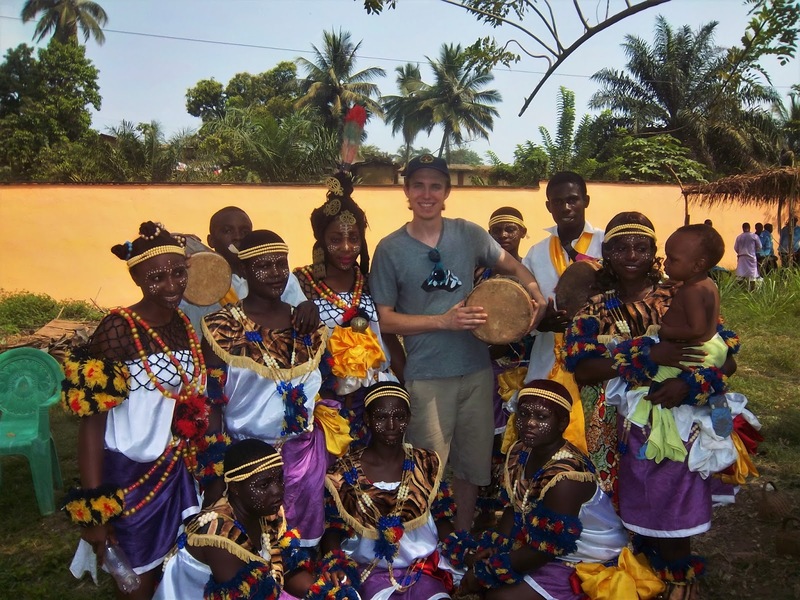 *Corbin Clark is a student missionary from Walla Walla University, serving in Cameroon through the Office of Volunteer Ministries and Adventist Volunteer Service. This was originally posted on his blog and is shared with his permission.